Music in the ATX: Do all these people even have a way to play Vinyl??? Do all these people even have a way to play Vinyl??? Saturday was the 3rd installment of Record Store Day but the first we have been in the right place at the right time. In case you don't know over 200 special releases were created to be sold at the independent record stores - no big box stores for this one. Waterloo was our target and we got there about 9:45 AM but unfortunately Austin really gets it, because the line was all around the block. The good news was that for me anything we got was a bonus - what better to do on a cloudy Saturday morning. My only real target was a single from Bruce but even that was optional. The good news to me was that most of the crowd seemed to have a shopping list and it didn't seem like a real Springsteen crowd. When the doors opened at 10 the line moved quickly and within 8 or 9 minutes we were in the door. Jo had come with fortunately as there was a one copy per shopper rule - which is a great rule in my opinion. With two aisles of special releases we decided to split up and good thing we did. My first grab was some Hendrix - a bootleg from a show in Mass in 1968 that included Foxey Lady and a cover of Wild Thing. Got to say that listening to it later it was a good pickup for $10 or so. Further down the aisle was a John Lennon packet that includes three separate singles and a poster and although I'm not a huge Lennon or Beatles fan it's a great Christmas present to have in stock. 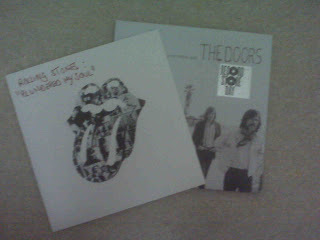 I also grabbed a Doors single with "People are Strange" as well and then the Stones released a single that was at the end of aisle 1. So it was a good start but still looking for Bruce. The bad news was that turning corners was a struggle as the restocking guys were already out and about and shoppers were grabbing singles out of the box before he even got a chance to put them on the shelves. Looked like one of those classic shopping scenes on TV with the ladies fighting over purses and to be honest most of the bands that caused the struggle I hadn't even heard of. My next pickup was the new Josh Ritter full length LP - "So Runs the World Away". Great thing about this was not only did you get the new full length album but also a CD version inside - all for $17. And better yet the CD isn't being released until May 4 so we got it a couple of weeks early. I was a big fan of his "The Animal Years" CD that the folks at Easy Street in Seattle turned me on to a few years ago. His last disc, "The Historical Conquests of Josh Ritter" didn't do much for me so I'm hoping this one grows on me! Right about this time I also spotted an interesting single with the Courtyard Hounds (2/3 of the Dixie Chicks) on one side and Jakob Dylan on the other side. After seeing him at SXSW I have his new project on my list for the year of shows to see so I took one of these as well. Just about that time I ran into Jo as her aisle was much more crowded than the one I went up. 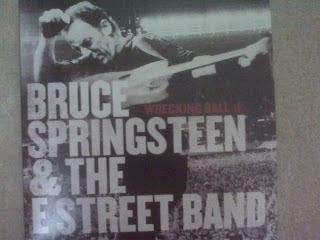 And she had found the Bruce single and grabbed two copies -one for each of us. And fortunately we had split up since after she took the two there was only one more left and from what we could see the rest of the day - no restocking! 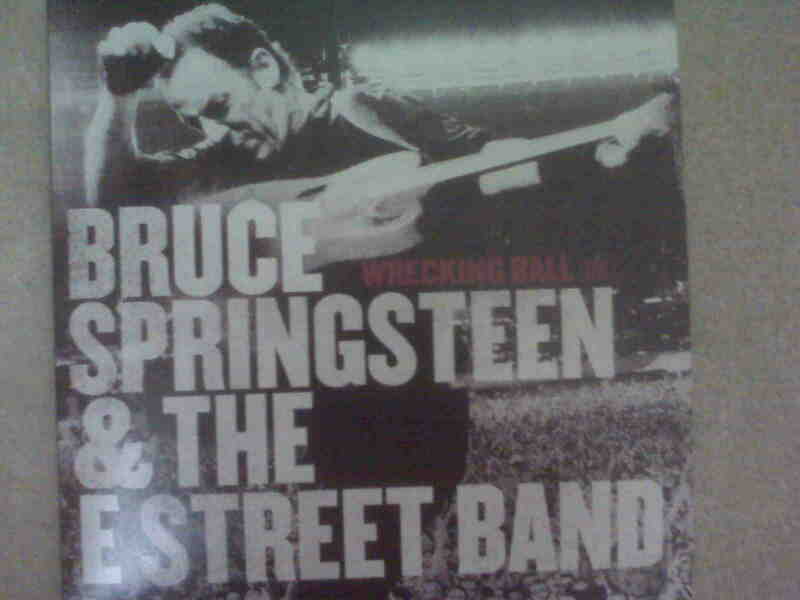 The single has Wrecking Ball on side one (song written for the last show at Giants Stadium and which he also performed both nights we saw him at MSG in November) as well as "The Ghost of Tom Joad" featuring Tom Morello from Rage Agianst the Machine at the Anaheim show a couple of years ago. Even though I already have that on a Magic Tour Highlights CD it's always nice to have it in vinyl as well - it's a spectacular performance that my friend Bill in PHX was lucky enough to see live! At that point we figured we had spent enough money on vinyl and decided to head for the check out line. It looked like Black Friday at Best Buy - all the way to the back of the store with two lines but it moved fast and only took about 15 minutes with a bonus! Not only did Waterloo get just about every one of the special releases but when checking out we were each given a special "Record Store Day" promo album featuring a bunch of new and breakout bands (including Austin's Alpha Rev who I have heard a lot of good things about) as well as a special Record Store Day shopping bag to carry your albums around in! I have read a lot of complaining on some sites about the lack of inventory, copies being held back, etc but isn't that part of the fun. If there were unlimited copies would people really be all excited and stand in line? 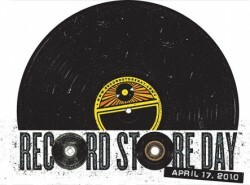 Even if I had been shut out it was a fun experience, I am lucky to live in a place with a spectacular record store (#2 in the newest Spin magazine ranking of Indpendent record stores) and we should be grateful that Record Store Day exists. 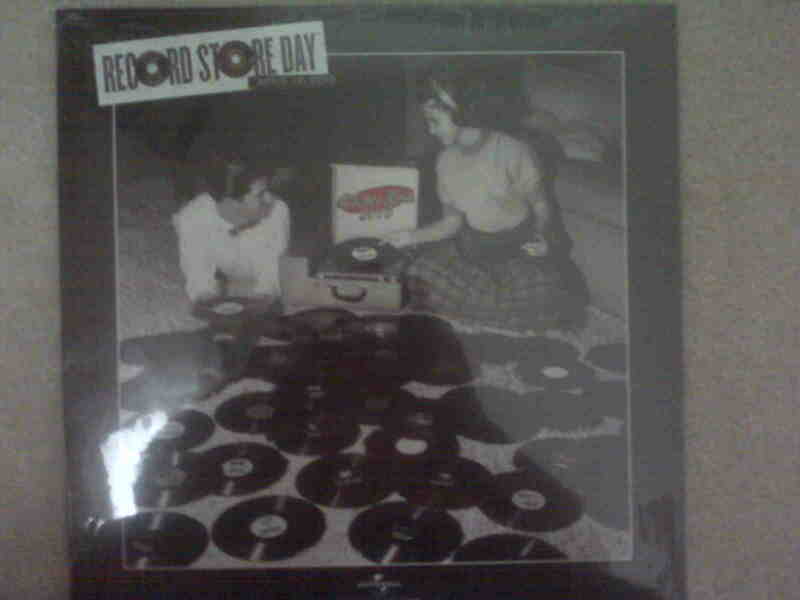 Looking forward to Record Store Day #4 in 2011! Up next - Off to the Northwest, at least one visit to Easy Street Records and hopefully some live music at the Crocodile Cafe!